How will the markets react to this year’s crop of IPO aspirants? Mascoma, a biofuel and ethanol startup, just filed its S-1 registration with the SEC for an initial public offering. The firm is VC-funded and is one of four biofuel companies interested in reaching the public markets. 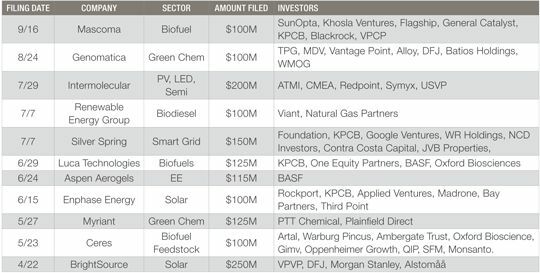 This year a number of biofuels firms have made it through the IPO window, including Codexis (Nasdaq: CDXS), Amyris (Nasdaq:AMRS), Gevo (Nasdaq:GEVO), Kior (Nasdaq:KIOR), and Solazyme (Nasdaq:SZYM). Like every greentech IPO that's priced in recent history, Mascoma has low revenues, large losses, and, in Mascoma's case, an unhealthy amount of revenue from government grants. The company has raised about $135 million in venture capital and debt. So while we're looking at Mascoma, I took the opportunity to compile a list of those 11 greentech firms with S-1s currently filed. Three of the firms have investment from Kleiner Perkins. It will be revealing to see the solar and smart grid entries price their offering -- that will provide a real indication of investor appetites in these sectors and serve to encourage or discourage the next startups in line to file.